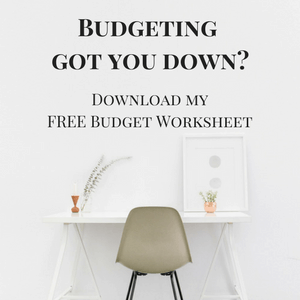 Every quarter, we sit down and go over our current budget and savings plan. I analyzed what needs improvement and what has improved. I’ll be the last to admit, but, things are looking up. Making the decision to track our net worth has really helped us. There was a time we really struggled with ways to save. We often took bad money tips from friends and family that also needed help on how to save. Talk about “the blind leading the blind.” Not sure if you can relate, but, your girl has come far! So, with time and experience, I’ve learned creative ways to save, some people might even say they were weird or unusual ways to save money. That is right! I have been utilizing this little money saving trick for years. Why go wasting your hard earned money on a new pair of pumps. If the heel or bottom is damaged there are plenty of shoemakers still around the way that can fix your shoes like new. It is a hell of a lot cheaper than replacing. Oh, this tip applies to men as well! I know what you’re thinking… Belle, I live in the city how the heck in my going to grow my own vegetables? To that I say, my friend, ‘this tip does not apply to you, sorry.’ In actuality, this tip was suggested by a vegan friend of mine who was trying to reduce her chemical intake. She realized cutting meat was huge savings to her pocket and growing her own vegetables she almost eliminated the need for the grocery stores altogether. Yes, she had a very nice yard and a beautiful garden. But, for most of us who don’t have the time, space or ability to grow our own food. A meal plan can come in handy. This is what is currently saving our family grocery budget month in month out. You can check it out here. OK, I am not going to name, names for this savings tip. Let just say when times are tough you may have to do some extreme things to survive. To make light of a tough situation, you really can find some cost benefiting things in someone else’s garbage. Also, you don’t technically or literally have to jump in a dumpster or go through trash. Just keep your ears pierced for friends who may be getting rid of something that might be cost effective for you. Nowadays, with sites like eBay and Craiglist, you definitely do not have to dumpster dive. This one is a bit nostalgic for me as it hits really close to home. When I was a child towards the end of the month or when all the soda/beer cans and bottles piled up. My parents would take us to the local recycling store to cash out the bottles. I was always excited to go and line up the bottles and cans perfectly into their corresponding boxes. There were none of these automated recycling machines like we have today. It was actually an area of people working diligently to count and move all those cans. It was almost like an orchestra in motion. We made it work each time. It was a reward! Money in our pocket, that otherwise would have been thrown out. This is a smart money saving tip, I think. It works well in the produce, bakery, and prepared food section of most grocery stores. Walk in about a half an hour to an hour before your grocery store is about to close for the evening. Now, ladies, we do not have to admit to this one! At the moment we bought we wanted it, right! We just wore it out that one time to gather the opinions and reactions of our friends right!? Don’t judge us! But the reality is when you struggling this works. Truth be told: we’ve all done this once or twice before. There’s even a site created just for that! Rent The Runway, have you heard of it? Rent The Runway, allows us to look cute, use, and return! That’s why I love and highly recommend it. Perfect timing with this tip, after I suggested you “borrow and return” in the tip above. I really believe in the power of Law of Attraction. When you treat and do good by others even when you possibly at your lowest it will come back 10 folds. Treat others with respect and just be a good person. The universe has a way of helping you gain what you are looking for in time. My roommates and I one summer did this extreme method to save money and cut costs. We used lights and electricity at a bare minimum. We watched t.v. in the dark. Instead of an air conditioner, we all used those fan that blew nothing but hot air during the day. The fan was not so bad at night. Yes! Dumpster diving made it twice on the list. it’s just that #lit! You can have a field day on the stuff you can find on a college campus that gets thrown out at the end of the year. You can furnish your whole dorm for the following year. Shoot, if you are a looking for some little knick-knacks for your own house it’s not a bad spot to start. College campuses at the end of the year are like a free flea-market and you can save a lot here. I was once a recipient of two air conditioners that were going to be tossed out. It was a score for me because I kept one sold the other and I eventually sold the other when we moved into our loft. Great tips! They were…unconventional to say the least, but that’s exactly what we all need to get the most savings! I love watching dumpster diving videos on YouTube. These people find the craziest things in there that have never even been open! It’s sad to think how much is wasted. YouTube is awesome! The waste is sad to see, I sometimes wish they donated instead of tossing it out.